Because of my job, I visited Aveiro to attend a meeting called NERES 2007. I arrived some days before, with a colleague from my department, doing a change in Madrid to Porto and then taking a very cheap train to Aveiro (it seems that a lot of Portugal flights pass through Madrid, now I understand why some portuguese looks us as the invasor hehe) . We were going to meet first, some partners from the Univeristy of Aveiro, with which we are doing some collaboration. It ended up being a very interesting and productive chat. Our portuguese partners were really nice with us and showed us a lot about Aveiro, like the coast part and a delicious dinner that we had in a small village nearby ( we took "leitão", which is similar to the spanish "cochinillo", a small pig). Aveiro (http://en.wikipedia.org/wiki/Aveiro) is an atlantic city. You notice that the moment you get there because of the wind. It is a beautiful city surrounded by canals and small boats. 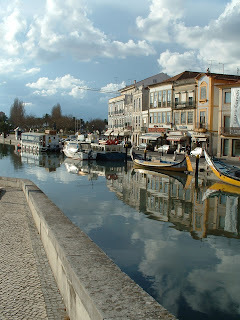 The central point of Aveiro, I think, is a roundabout in rua coimbra that crosses the canal do cojo. One of our hosts told us that the University is now the main source of "life" in the city. I could not see a lot of students because they usually go back to their homes (ie in Porto) at weekends. I gave a short talk in the NeRES meeting about my project that you can find here.